Where our Dachshunds Place Footprints Upon Our Hearts! Note: Our Puppies are born, loved and raised in "Our Home" with us and our children. We are not a retail operation nor a Pet Store for complete strangers to just drop in. please submit an "Puppy Application" using the website link and feel free to follow that with an email and or phone call. A couple of our Boys & Girls winning in the Show Ring! "Largh Pah BT Honeys Kreme Harley Deville"
Harley only needs a 3 point Major to finish his Championship! If you are looking for a potential show puppy or just a family companion puppy, at Honeyman's Dachshunds you can be confident you will receive a well bred happy, healthy, beautiful and well socialized puppy. We are a small, family orientated Hobby/Show Breeder in Ohio and we only have 2 - 4 Litter's a year. 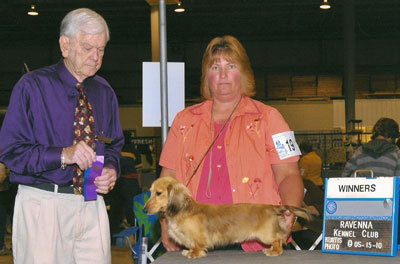 We have enjoyed Sharing the love of the Dachshund Breed with others over the past years. We are not a Kennel. Our Adults and Babies share our home (many times our beds), as well as our hearts as much loved pets and have wonderful, loving temperaments. Our babies are whelped and raised in our homes, well acclimated with other people, children and dogs. They are given lots of play time, love and care. Our Babies are bred for a lifetime of unconditional love & affection, home raised and pre-spoiled. It?s unfortunate that we can't keep them all because we fall in love with each and every one of them. Our few litters are carefully planned with the primary goal of producing Quality Miniature Dachshund puppies, with health, longevity, conformation and temperament being our #1 priority. We believe in Quality not Quantity and are always looking for that next little show puppy. Our Puppies receive all age appropriate vet exams, worming & vaccinations before they go to their new homes. We worm our babies at 2 - 4 - 6 & 8 weeks. They will have had their 1st shots and their last health check by our Veterinarian at seven - eight weeks of age. At 3 1/2 to 4 weeks of age they come out of the whelping crate into a large puppy play pen in our living room and start their potty pad training so that they are well associated with potty training, other people, dogs and household noises by 8 weeks of age. Our Adults have their yearly vet exams, receive all of their yearly vaccinations including monthly heart worm preventative and are wormed monthly. We provide shot - worming & health records, 16 pg. information booklet on Puppies and Dachshunds, Copy of Parent's AKC Registration Certificates to prove AKC Linage, Eukanuba (Purina One or Purina Pro) puppy packet w/ food and coupons, Baby pictures, blanket and toy with siblings scent, & a written 1 Year Health Guarantee/Sales Contract which protects, the Buyer, the Breeder, and most importantly the Puppy. Prices are quoted as Pet Only on a Spay/Neuter Contract. If interested in Full AKC Registration with Breeding & Show Rights, please contact us. We are very selective when it come to giving Full AKC Registration. We have smooth (short hair) and long coats various colors (UK English Cream, Red, Blk & Tan, Chocolate, Fawn (Isabella), & Blue) in solid, dapple, piebald, & dapple piebald. We do not do the double dapple as we feel there are too many cons and genetic defects to this type of breeding. We require a deposit of $300.00 for puppies $650.00 and below (Young Adults & Retiree's). A deposit of $350.00 for puppies above $651.00 - $1000.00. A deposit of $500.00 for all puppies over $1000.00. This deposit is required to hold the puppy of your choice. All deposits are non-refundable. I also have the right to refuse any sale to anyone at anytime for any reason, especially if I feel it is in the best interest of the puppy!! I have a spay/neuter contract that everyone must sign unless breeding & show rights are granted....these are given to only a select few!! We will continue to welcome our new prospective families into our home for puppy play visits and to pick up their new Puppies as we have always done. I will continue to be happy to drive and meet my new Parent?s halfway for a reasonable delivery fee. I have driven up to 8 hours 1 way to meet new Parents. You may fly in to meet me at the Airport or to come visit our home to pick up your Puppy and then fly it back home on the flight with you as your carry-on. I will gladly meet you at Dayton, Cincinnati or Columbus Airports with your new Baby or to pick you up. (Dayton is the closest Airport). You are more than welcome to purchase a round trip Airline Flight for me, forward me the 125.00 charge the Airlines charge me to bring the puppy on as my carry-on, and I will personally deliver your new Baby to you at the Airport of your choice. All puppies must be at least 8 weeks of age before transferring to their new homes and many are 9 - 10 weeks before they are ready to leave our home and their siblings. All Puppy costs, which are paid by the purchaser, (If applicable) must be paid in full before the your puppy leaves with you to its new home. We do not knowingly deal with Pet Stores, Puppy Brokers or Puppy Mills. We reserve the right to refuse the sell of a puppy to anyone in question. We want our Puppies to have the best forever homes, with people that will LOVE them as a new addition to their family. All of our new Parents are assured that they have a lifetime of support from us with open communication lines for the lifetime of their new baby. References from Past Puppy Buyers and Vet are available upon request. Our Motto is: Dachshund's are just like potato chips...You can't have just one!!! The only breed that we raise are Miniature Dachshund's and our lives wouldn't be complete without our "Wanna Be Bigger Dogs"! Please feel free to browse through our picture albums. Please do sign our guest book and let us know how you like our web site. Our Grandson "A Large Part Of Our Hearts Have Went With This Little One"
Born April 7, 2010 Died suddenly June 27, 2010 at 11 1/2 weeks of age. Services were held at 3 p.m. Friday, July 2, 2010 at the Riverside Cemetery Chapel in Troy, with Rev. Robert Lewis officiated. world seem wonderful and mild. that dwell up there like yours and mine, were old? How strange would heavens music sound, when harps begin to ring. If the children were not gathered ?round to help the angels sing. He knows we need their sunshine to make the house a home. come to stay just lends them for a while. Sometimes it takes them years to do, the work for which they come. Sometimes in just a month or two our Father calls them home. I?d like to think some souls up there bear not one single scar. I love to think of heaven as a place where children are. and lightened the hearts of many families with one of her Dachy Babies. person who helped me start out in Dachshund's around 11 years ago. She will be sorely missed and takes a piece of my heart with her. Please keep Wanda's Husband David and their family in your prayer's. Sissy, and especially our friend. just a while until we are all together again.